Hello friends! Today I am showing you a project I have been working on. It's a 5.5" x 11" chipboard album that I am making of my sisters. Since I have very few photos of us as kids, I wanted to try to make something that would tell our story a little bit for generations to come. I am working with very old black and white photos that are poor quality, making copies of them and trying to edit them to be a little better. In some cases that's working and in some it is not. Most of the time involved with this has been trying to get decent photos to put in the album. Anyhoo... above is the cover for the album. 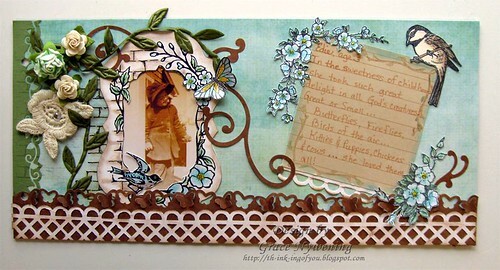 I used designer papers from Prima "The Sasha Paper Collection". I stamped the flourish from Layers of Color Nature Walk clear art stamp set with White Craft and heat embossed directly on the dp, and added some Prima flowers and chip board letters from K&Co. I sewed around the edges and added some pearls and ribbon from my stash. The butterfly is from Layers of Color Flutterescent art stamp set and is stamped with Stazon on vellum and colored on the back. I have sponged on the flowers a bit to give them some age, since the pictures in this album will be old. This first page is using the same Prima pack for the designer paper, but I used Layers of Color Brick Wall and Garden Wall Frame cling art stamps. Again, this frame is designed for the Spellbinders Label 14. I colored lightly with Pebbles Chalks which are pearlescent. I added some flourishes from QuicKutz and punched edges made with 2 Martha Stewart edge punches and one EK Success punch. The butterfly is from Layers of Color Flutterescent art stamp set and has Stickles added, as do the flowers. My journaling card is Crafty Secrets and I surrounded that with flowers from LOC Merci Bouquet art stamp set and the little Chickadee from the LOC Backyard Birds art stamp set. Here is some detail on the Brick Wall Frame and the brick wall. I love both of these and love them together! The brick wall can be stamped continuously for a solid wall too if you want that look. On this third page I used Layers of Color Victorian Frame cling art stamp which is designed to fit the Spellbinder's Label 14. I love this frame! I colored with Copics and then embossed with UTEE to give it a shine, cut out the inside and framed my picture. I wanted to add lots of pink to this one so I stamped the Layers of Color Cottage Rose cling art stamp and colored with Copics, and cut out. I paired that with Layers of Color Vintage Rose and Nature Walk clear art stamp sets, as well as a butterfly from Flutterescent art stamp set. My embellishments are only a sheer pink ribbon, heart charm that says "love" and a vintage brad as a center for my flower. 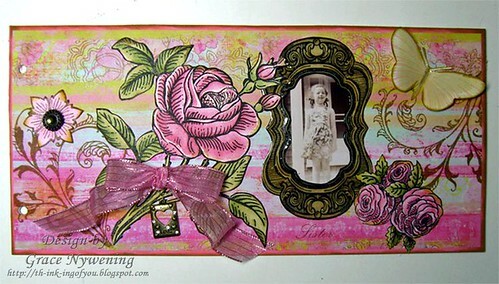 I have done quite a bit of sponging to this page and it is matted with a pink piece of cs. I have a long ways to go on this album but I wanted to show you what I have been working on so far. These first pictures are of my oldest sister, who passed away at the age of 44. Although she was 10 years older than me, we were still close. I will always miss her but this little memory book will be a great way to pass on some of my memories to my grandchildren who never knew her. We are excited that Layers of Color is a preferred Spellbinder's Company! Thanks as always for visiting! Have a blessed week! Grace what a great tribute to your sisters! I loved seeing the photos of your sister. I love your placement of the butterfly on the page with the brickwall frame. It looks gorgeous! Beautiful work. Grace I love this! What a treasure to pass down for generations to come! Hello a very beautiful album, the design is gorgeous. This is such a beautiful and loving thing to give! It is beautiful and thoughtful! I love the way you are making each page. The colors the floursihes, the ribbons the beautiful butterfly and roses. Fabulous! The cover is amazing! Each flower is wonderful. The backgrounds are wonderful....There is so much love in this...It just oozes out! Grace this is so delightful, the colours are awesome. Thanks for joining us at Paper Sundaes this week. What a beautiful project. I am sure it will be treasured! Thanks for playing with us at Paper Playtime this week. Grace this is one stunning project!!!!! WOW what a wonderful sis you are they will go crazy over this!!!! BEAUTIFUL! This is really awesome Grace. What a great way to look back on all the memories you have.. Your grandkids will treasure this for years to come. You are so good at these books. I have mine on my shelf and can't wait to put it in my new stamp room.. May be done by the time I am a grandma..haha.Hugs to you. What a wonderful project and a great family treasure! I lost my sister a few years ago and her memories are what sustain me now...I will always miss her but photos and memories keep her alive to all of our family! Thank you for entering into our challenge at AiFactory this week with your wonderful project! We are having a Design Team call right now in case you are interested.I think you would be marvelous! What a fab keepsake and conversation piece too. Thanks for sharing it with us at Penny's and good luck in the draw. What a gorgeous design!! All the details are perfect! Wow Grace, what an amazing keepsake this will be! Thank You for joining us at Gingerloft this week, good luck! 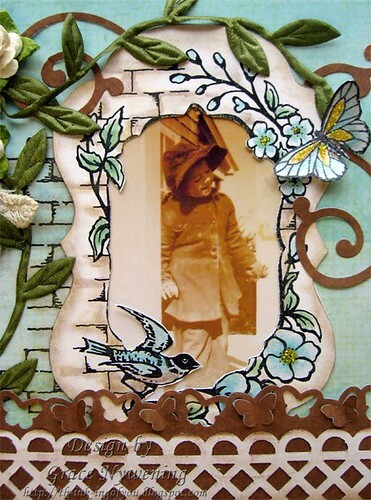 Exquisite work and a wonderful way to keep your memories alive. Thanks for joining us at Delightful Challenges. beautiful album! I love all the elements. Thanks for playing the critter sketch challenge. Oooo, can I be your sister? LOL! Oh, my this is SO special and SO beautiful, Grace! I love the colors, the feminine details and the loving mood...beautiful!! This is so wonderful Grace,I love your papers and the colours. Stunning! I love mini albums and this is so beautiful. Thanks for playing at Paper Sundaes this week! Oh, Grace, your album is beautiful. stamp you used is adorable. Thanks for joning us at Lets Ink t Up this month and good luck! 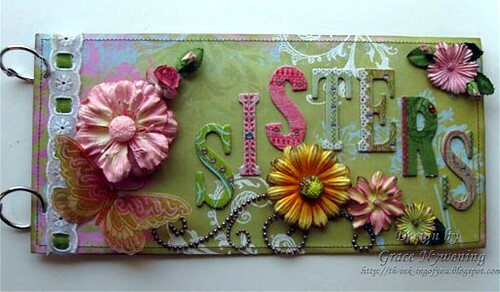 Wonderful Creation and beautifully put together..
What a gorgeous sister's book Grace!! I just love all your details, colors and coloring!! What a beautiful way to treasure your memories!! Such a neat idea - it's beautiful! Thanks for joining us at Critter Sketch Challenges! I adore albums and this one is beautiful made with so much love and patience. Thanks for sharing with us at Let's Ink it Up. This is just gorgeous Grace! Thanks for joining us at Penny's Paper-Crafty Challenge! Hope to see you again real soon! This is just OTT - what a fabulous project! Thanks so much for joining us for this week's Critter Sketch Challenge and we hope you will join us again next week for another exciting challenge! Fantastic project- what a special gift for your sister! I am sure it will be cherished! Thanks for joining the Belli challenge. Beautiful project! Thanks for playing along with us at Penny's!! Oh WOW! So many details and it looks fantastic! I love all of it that I can't even pick a fav page! I love the papers you have used. Thank you for sharing and playing along with us at Gingerloft Challenges. This is such a great idea! What memories! Thanks for playing at Let's Ink It Up this month!